BANFF, ALBERTA, Canada – Don’t waste your vacation in the car, straining to get a better view — the best way to experience the Canadian Rockies is with a Banff helicopter sightseeing tour. Get a bird’s eye view of Banff on a helicopter tour with Icefield Heli Tours. Choose one of our sightseeing tours to Cline Glacier, Wilson Glacier, or Columbia Icefield, or book one of our seasonal adventures that combine our helicopter tours with horseback riding, hiking, yoga, or fishing in the summer and snowshoeing, champagne picnics, skiing, or icewalking in the winter. Whichever option you choose, rest easy knowing our experienced pilots will get you there and back safe and sound. Open year round and conveniently located near Lake Louise and Banff National Parks, our tours will take your breath away. Your Banff Canada vacation will not be complete until you take a Banff helicopter tour, enjoying the incredible scenic beauty of the Canadian Rockies. 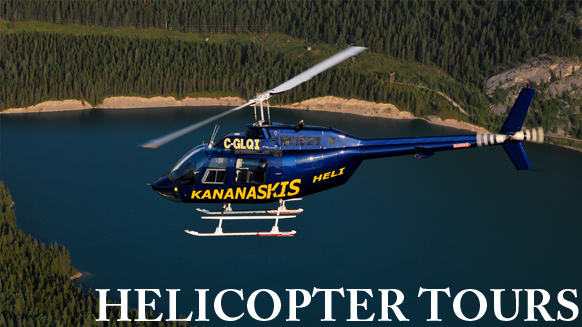 Have fun in the sun with helicopter adventure tours in the Canadian Rockies with Icefield Heli Tours. Let our pilots whisk you away to remote locations with panoramic views. Choose one of our adventure packages that will have you hiking, practicing yoga, horseback riding, fishing, or chowing down on a BBQ picnic during your next Banff Canada vacation. Bring your "memory machines." Cameras, camcorders, and cell phones. The views are spectacular. Helicopters are outfitted with 180-degree windows, giving you full canyon panoramas. Remember to charge your personal electronics the night before. Binoculars are also helpful.